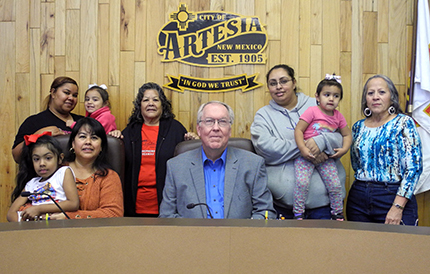 Mayor Raye Miller is joined by, from left, Alicia Carrera, Isabel Duran, Sally Carrera, Ava Carrera, Alicia Bustamante, Rosa Carrera, Ariana Carrera and Elsie Bustamante as he signs a proclamation last week declaring December “Donate A Toy Month” in Artesia. “Toy drives supply not only toys to children in need but also spread the gift of a smile to children and their families,” the proclamation reads. “Through the Good Shepherd Toy Drive, the holiday spirit will be felt throughout the community as well as in the hearts of the children receiving the gifts.” Forever Free Fellowship is currently accepting toy donations for its 18th annual drive. Toys will also be accepted from 11 a.m. – 3 p.m. Saturday, Dec. 8, at the corner of 13th and Main streets. For more information, call 308-3557 or 520-1075. The toy giveaway will be held from 4-6 p.m. Saturday, Dec. 22, at Forever Free Fellowship, 801 W. Grand Ave.